By the end of the Migration Period the marauding Huns had been dispersed east of the River Danube and the peoples they displaced had mostly settled new lands in the west, at first with the permission of the crumbling Western Roman Empire but later attacking and capturing its possessions for themselves. For the Visigoths, this meant a kingdom that sat astride the Pyrenees, in both Hispania and Gaul, with their capital at Toulouse. 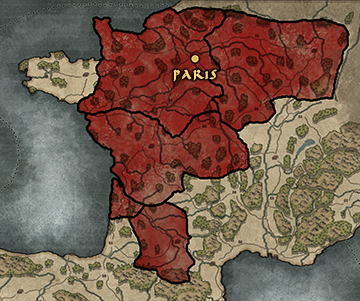 Since then, they have been at war with the highly-aggressive, expansionist Franks to the north, their Burgundian allies, and the Suebi in the northwest corner of Hispania. Now, in AD533, the only Gallic territory still under Visigothic control is the southern province of Septimania, under constant threat of attack from the Franks. Yet war has also raged away from the battlefield; much of the Visigoths’ trouble has been exacerbated by internal instability, and brothers have killed brothers for the throne. In addition, the Ostrogoths have had a controlling interest in the affairs of their neighbours and kin for some time, Theoderic the Great even installing his grandson, Amalaric as king in AD511. Since his death, Theudis – Theoderic’s loyal swordbearer and a man of common birth - has been elected king, marrying a local noblewoman and treating the largely-Romanised population fairly and justly to strengthen his position at home, and raising an army independent of Ostrogothic influence. His goals are thus: to recapture the territory lost in Gaul to Clovis’ Franks and to consolidate the Visigoths’ holdings in Hispania, and if the Vandal Kingdom collapses under pressure from the Romans there may be land for the taking in northern Africa. Who knows, such things may even allow the Visigoths to control and dominate Mediterranean trade – making their kingdom far stronger than any before it! 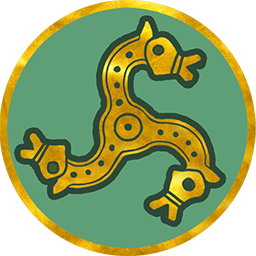 The Franks are a confederation of Germanic tribes who, in return for fighting as Roman federates, settled and formed a largely independent kingdom in Gaul. Since the collapse of Rome’s Western Empire, they have greatly extended the territory under their control. Battle Honour: No penalty to integrity from casualties suffered in battle. Alanic Heritage: +3 experience for cavalry units upon recruitment. Reformation of the Western Empire: Control 40 regions to gain diplomatic option: Join Empire.